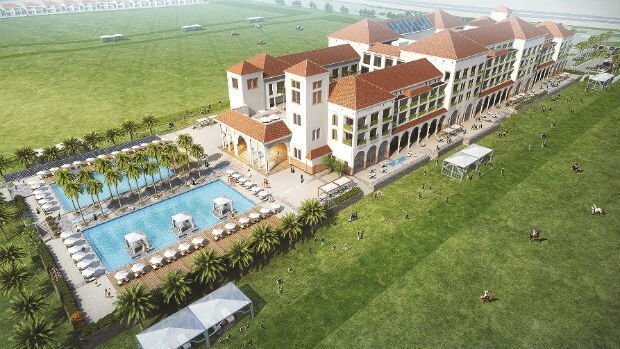 The St. Regis Dubai, Al Habtoor Polo Resort & Club had its soft opening on Monday. The launch of the Andalusian-style resort – the first St Regis-branded polo resort globally, close to The Villa and 611 Road – marks the end of a busy period for the group with the four-star Metropolitan Hotel Dubai having its official opening last night, complementing the trio of five-star hotels at Al Habtoor City (St Regis, W and Westin). Although the hotel offering at the polo resort is boutique, the resort is built on a large scale with 150 villas (three- and five-bedrooms) and three polo fields – along with stables for 520 horses. F&B includes Taperia (tapas), The Grill Pit (Argentinean steakhouse), Oasis lounge (Arabic), Andalucia (Mediterranean), Equestrian Lounge and St. Regis Polo Bar. Hotel guests will be treated to St Regis’ trademark butler service. Online rates for a deluxe polo view room start from Dhs1,260 a night. Al Habtoor added that work on La Perle by Dragone at Al Habtoor City will be finished by March but with the onset of Ramadan and summer, performances will begin in August.